Dr. Vinayak Namannavar has been passed in B.A (Basic Sanskrit and Optional Sanskrit) with first class from Karnataka University, Dharwad.and M.A. in Sanskrit with specialization in Vedanta sastra from Karnataka University, Dharwad. He has been awarded Ph.D for his research thesis “Bhagawathasaroddhara of Sri Vishnu Tirtha, a critical estimate” from Karnataka University, Dharwad. He has been studied P.G. Diploma in Mass Communication and Journalism from Karnataka State Open University, Mysore. He has another P.G. Diploma in Manuscriptology from University of Mysore. He has Attended many National and International seminars and workshops and published more than12 books, 8 research papers, 20 articles in different magazines. He has 4 years of research experience and 11 years of teaching experience. He has guided 18 students in P.G. Diploma in Manuscriptlogy. He has delivered various lectures on Ramayana, Mahabharata, Purana, Veda, Upanishads and Sanskrit Literature. 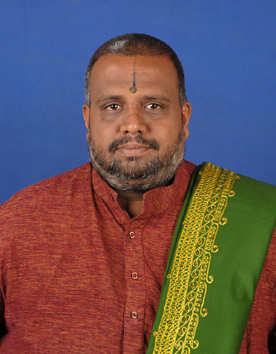 He is expert in various scripts such as Nandinagari, Nevari, Sharada, Grantha, Mythili etc. He is currently co-coordinator of Sanskrit evening college and P.G.diploma in Manuscriptology in Karnataka Sanskrit University, Bangalore.